Professor Heitor Alvelos will present two projects currently under development at his Research Center, Unexpected Media Lab / ID+ in Porto, Portugal. A subsequent Q&A session will be most welcome, particularly in regards to the potential for comparative studies with Macau. Anti­Amnesia: Design research as an agent for narrative and material regeneration and reinvention of vanishing Portuguese manufacturing cultures and techniques. Anti­Amnesia stems from an evidence: traditional industries in Northern and Central Portugal face core viability challenges due to radically new production models and fast consumer shifts. Simultaneously, a wealth of historical crafts and skills face disappearance due to a lack of resources, communication and narrative. We posit there is reciprocal value and potential for recovery in a dynamic convergence of traditional industry and historical craft towards mutual reinvention and re­vitalisation. Wisdom Transfer: towards the scientific inscription of individual legacies in contexts of retirement from art and design higher education and research. Wisdom Transfer aims at establishing the groundwork for an acknowledgment, communication and activation of contributions to culture and society from knowledge and experience by retired art and design [AD] academics. The scientific heritage of AD may have preceded the actual discipline through a first generation of researchers that led a transition from practice to academia; yet this heritage has been off-radar due to a lack of a framework beyond curricular and scientific demands. It is argued that the legitimisation of empirical experience in AD research will contribute to the scope and depth of the discipline, and further inform multi-disciplinarity. 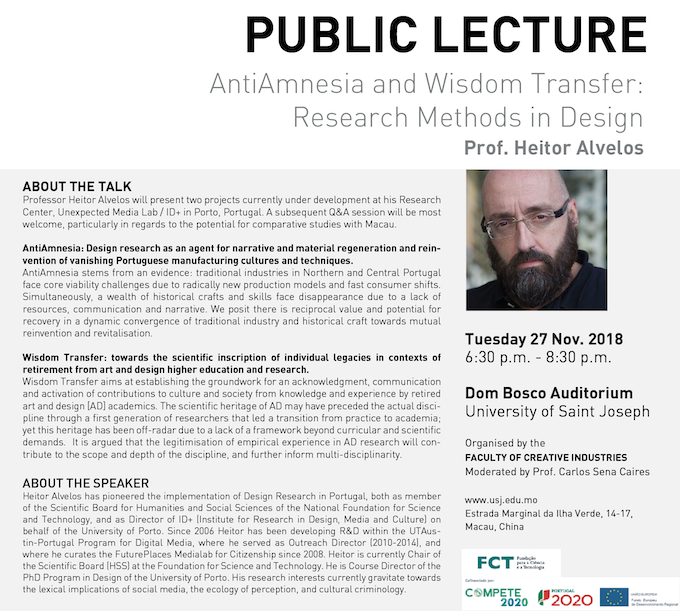 Heitor Alvelos has pioneered the implementation of Design Research in Portugal, both as member of the Scientific Board for Humanities and Social Sciences of the National Foundation for Science and Technology, and as Director of ID+ (Institute for Research in Design, Media and Culture) on behalf of the University of Porto. Since 2006 Heitor has been developing R&D within the UTAustin-Portugal Program for Digital Media, where he served as Outreach Director (2010-2014), and where he curates the FuturePlaces Medialab for Citizenship since 2008. Heitor is currently Chair of the Scientific Board (HSS) at the Foundation for Science and Technology. He is Course Director of the PhD Program in Design of the University of Porto. His research interests currently gravitate towards the lexical implications of social media, the ecology of perception, and cultural criminology.